It is dogma these days that the politically liberal care for more about the environment than those of conservative political strains. No political announcement can be made these days without commentators and pundits stating as fact that of course the conservative government making the announcement is weakening environmental laws in pursuit of profit or that the liberal government is strengthening environmental protections in order to save us all from ourselves. It's all quite convenient that it has been lost to relatively recent history that conservatives have long been at the forefront of pursuing conservation, promoted policies which were environmentally friendly decades before the modern and liberal movement began. It was they who tended to be friends of the very people who used nature in environmentally sustainable fashion. These days no environmentalist tale can be told that does not feature the greedy corporation or conservative politician that fairly cackles while pouring barrels of toxic sludge into some pond. 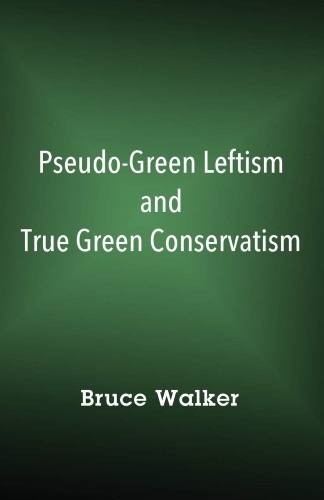 Bruce Walker’s slim tome Pseudo-Green Leftism and True Green Conservatism was written to take issue with this modern narrative. It is traditional conservative policies which promote the welfare of the planet, he argues, while liberalism harms the environment with the very big government, intrusive and interventionist policies they seek to or manage to impose on society. Economic and social conservatism, he argues, are natural processes which “looks for things of greater value than just material goods” and “views man as part of an organic whole” when he lives traditionally. To that end Walker martials arguments, numbers and examples to illustrate his argument that leftist policies tend to make the environment worse off. He cites extreme examples, such as the horrific environmental degradation that communism brought to nations behind the Iron Curtain, and contrasts that to capitalism which seeks to squeeze out every last efficiency from those resources culled for our use. Men like Henry Ford and Walt Disney, he writes, promoted environmentalism even while raking in money. Walker also takes aim at many of the assumptions that underlie the “green movement”, describing it as one labouring under internal contractions which fail to see nature as it is versus what liberals imagine it to be. Nature itself, he argues, preserves and conserves nothing and requires human intervention for that to happen. There is no such thing, he writes, as a nature that is unchanging and benign. Ultimately, the modern liberal environmentalist movement is simple about control of humanity with nature as the pretext. For the most part, at least for those inclined to agree with Walker, Pseudo-Green Leftism stands on reasonably firm ground. Where some readers – which includes conservatives – may have some difficulty with Walker’s arguments is the section entitled “Green Social Conservative Living”. Many will likely read this as shoe-horning cultural conservatism into an environmental treatise as Walker argues things like divorce, urban living and public schools contribute to environmental (and societal) degradation, and that a return to a more traditional America would foster a healthier climate, presumably both environmental and moral. And while that may be true, the genie of our morally permissive society isn’t likely going to be put back in the bottle any time soon. Whatever positive environmental benefits we will enjoy from traditional nuclear families and farm living will likely have to wait for some system shock to society enormous enough to return us to a morality that only the older social conservatives amongst us can likely remember at this point. This is not an argument against Walker’s contention in this section, only a note that it likely will not resonate with a reader who hasn’t read The Conservative Mind or wouldn’t even understand what standing athwart history, yelling stop would even mean. That mild criticism aside, Pseudo-Green Leftism is an interesting and effective culturally conservative environmentalist argument. Regardless of what one thinks of Walker’s prescriptions, most conservatives can agree with the foundations of his arguments, that the left plays a grand game of being the moral stewards of the environment but have a romanticized view of it straight out of feudal Marxism and pursue economic and social policies which harm humanity, an intended consequence, and ironically the environment itself, perhaps an unintended consequence. Irrespective of where you sit on the conservative spectrum Pseudo-Green Leftism is an imminently worthwhile read. Pseudo-Green Leftism and True Green Conservatism can be found at Amazon.com.